©Barry Sandland/TIMB – Barebones and fast,a recumbent with style. Photographer’s notes: It took a while to catch this recumbent on the bike path. It had far more speed that I expected. There were times when I wondered how too would manage the limited space available as he came upon pedestrians and cyclists in the other direction. Simple. He would ride a wheel into the grass and rip past on the side. Where there was supposed to be an ease in pace was actually a tougher section to chase. I was given a ride and actually enjoyed it. The steering took a few seconds. The bike does not need the rider to bring balance to the equation, so the trike simply moves where it is directed. Incredibly responsive. Kind of like what people want in a sports car, the rack-and-pinion steering effect. There will be a couple more posts about this recumbent. On the same ride, just a few minutes later, I came across two para-cyclists who were using the same trike for their transport. But that starts tomorrow. 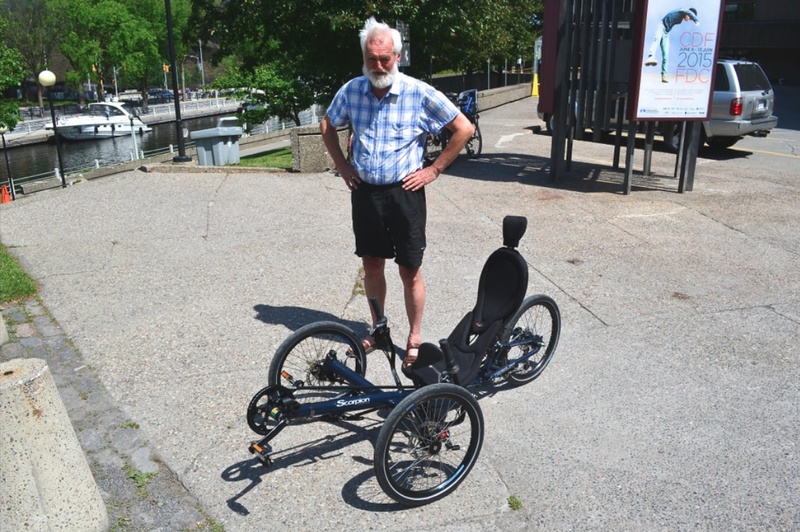 This entry was posted in North America, recumbent and tagged 2015, Canada, HP Velotechnik, Ontario, Ottawa, Scorpion, September. Bookmark the permalink.